if you had trouble with something commonly asked and want to contribute a question. add to this thread. then maybe we can create an ordered clickable linkable document for everyone. if you want to be silent and not have a FAQ - don't contribute, meaning you've got to contribute questions, if you want to see a faq. you don't have to have an answer to the question - we can supply it. Just supply the common question. 1 How do I change the timezone from utc to a different timezone for users who are not logged in (Guests)? Vanilla sets the internal time to UTC and then adjusts the time shown to logged in users to match their computer clock. to enable guest to see a different timezone e.g. if you want guests to set your time zone to Easter Island Time. see the timezone nearest you. 2 How do I make the yellow icon for "new" discussions appear? 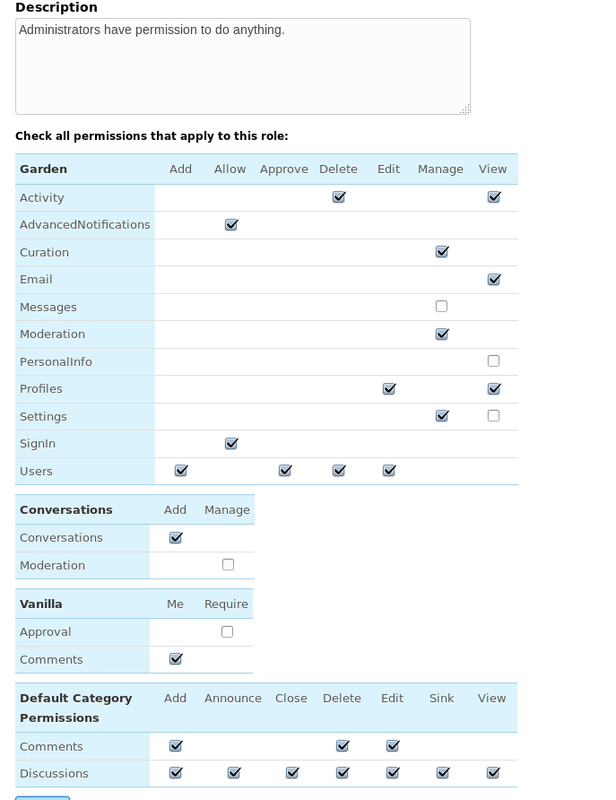 if users added one question at a time and moderator was able to modify the above Table of Contents. we could have an ongoing FAQ with a table of contents that pointed to any questions that were asked. some one could answer the question or point to a suitablr link that answers the question. and the moderator could edit the thread. If I had edit capabilties for this discussion only, I'd be glad to organize. Your php install likely lacks mbstring support. Recompile php with the --enable-mbstring option. If you are on shared hosting, contact your hoster about the issue. How do we find out the proper string for the timezone? For example, I want to set it to Pacific. $Configuration['Garden']['GuestTimeZone'] = "Pacific"; doesn't work. - 1 How do I change the timezone from utc to a different timezone for users who are not logged in (Guests)? - 4 How can I translate certain words or change wording? - 5 How do I create a config/locale.php if I don't have one? 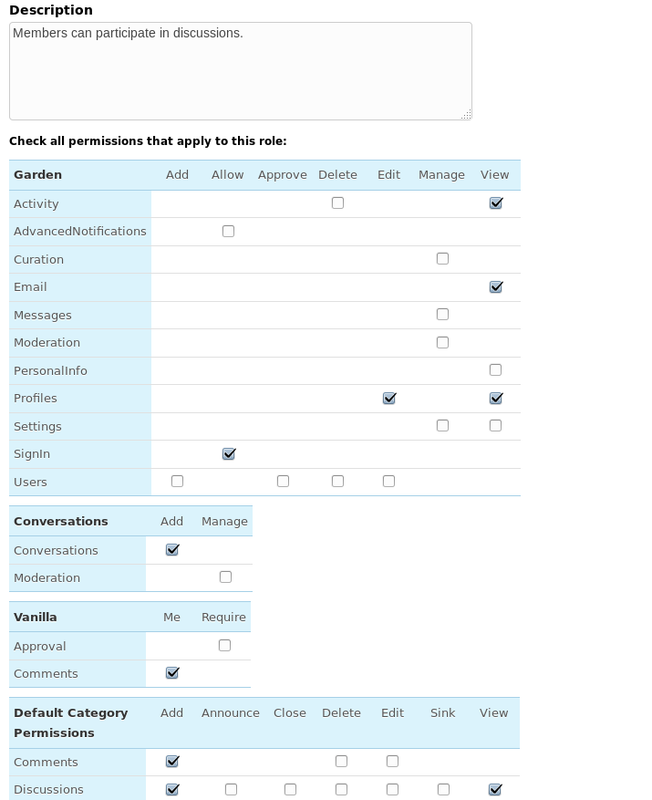 - 6 How do I add or modify configuration statements? if the line already exists, you should modify the right hand side. - 7 How do I find the version number of vanilla or the version number of a plugin that i am using? - 8 Why should I provide the version number of vanilla when posting a question? - 9 Can I plug in my own user system? How do I have a single signin with another site? 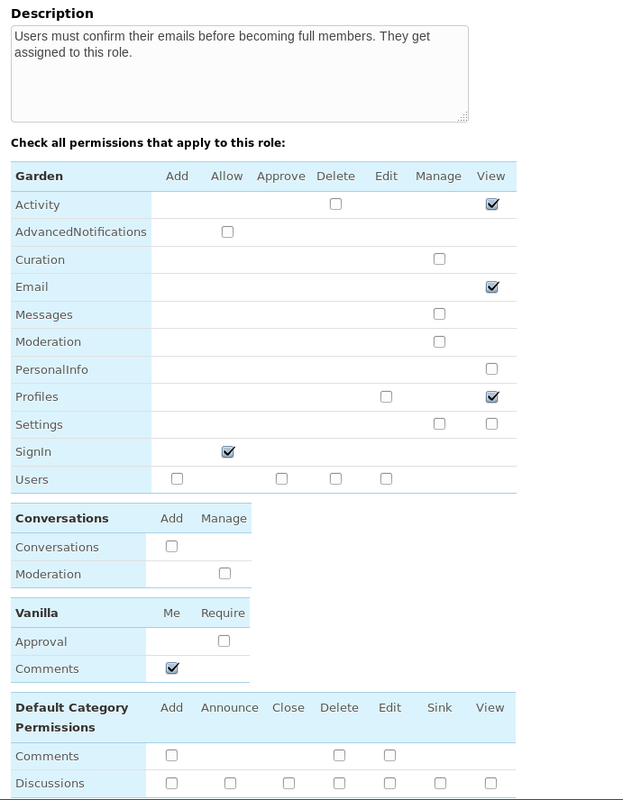 - 10 How do I allow users to upload files in discussions? until a newer version of uploading comes out. - 11 How can I allow users to delete their own posts? $Configuration['Vanilla']['Comments']['AllowSelfDelete'] = TRUE; // allow self-delete of comments. However, they cannot delete discussions, since this would allow them to delete other peoples comments in discussion as well, which would not be a good idea. I would think an excerpt and source would be better for a FAQ style discussion. Meaning, provide a link of course, but also answer the question without having to go to another page. Right now this discussion just looks like an index to other discussions. I have a blank page or a page that says "Something went wrong". What do I do? You enable debugging mode by adding $Configuration['Debug'] = TRUE; to your /conf/config.php file. This is called enabling debug mode. Refresh the page. This should display a more detailed error notice. Search the forums for that error notice. - 13 Is it possible to show the actual text of a new comment in a notification? which adds text of body, instead of just a link to forum. - 14 I have an error when trying to upload or change my avatar picture? this could be several reasons. your /uploads folder in the forum folder is not writeable and readable by php. 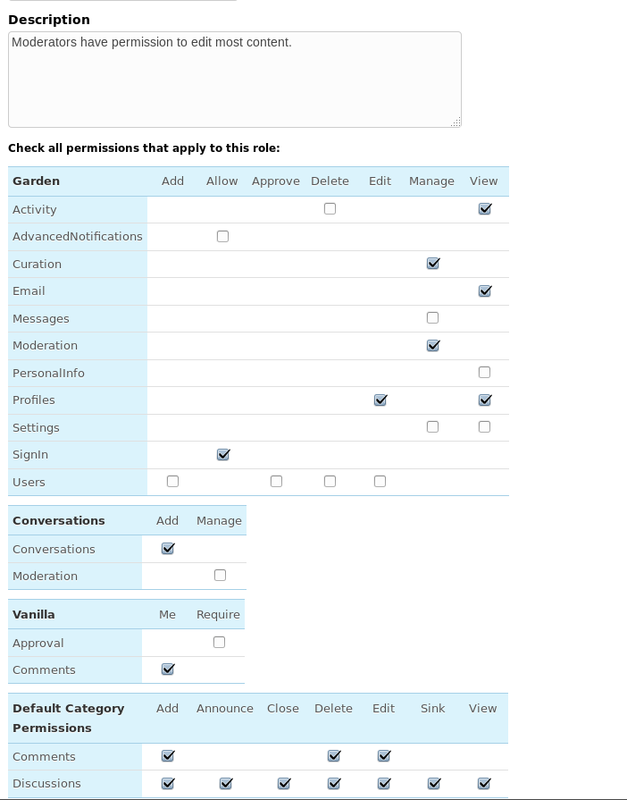 the permissions in dashboard for the role does not have profile edit checked. you have a config statement in config.php that prevents it i.e. you php is set to prevent file uploads. or the image file extension is not allowed, or the file is too large. or your GD library is not a minimum of GD version 2.
you can add this script to the root of your forum folder. or you can create a script with phpinfo(). 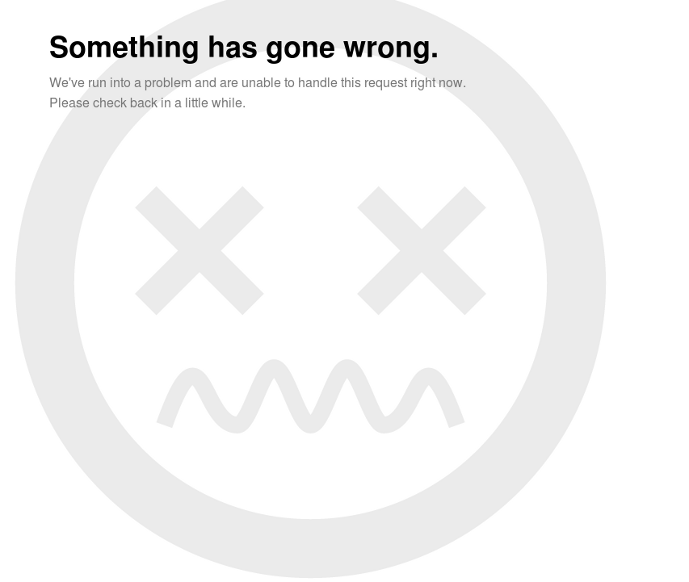 - 15 What do I do if I see the image below that states "Something Has gone wrong". Do not post your error message in this thread please. - 16 My counts for categories and discussions are not correct. what should I do? - 17 What do I do if someone says run /utility/structure or /utility/update? - 18 How do I reset the default roles? 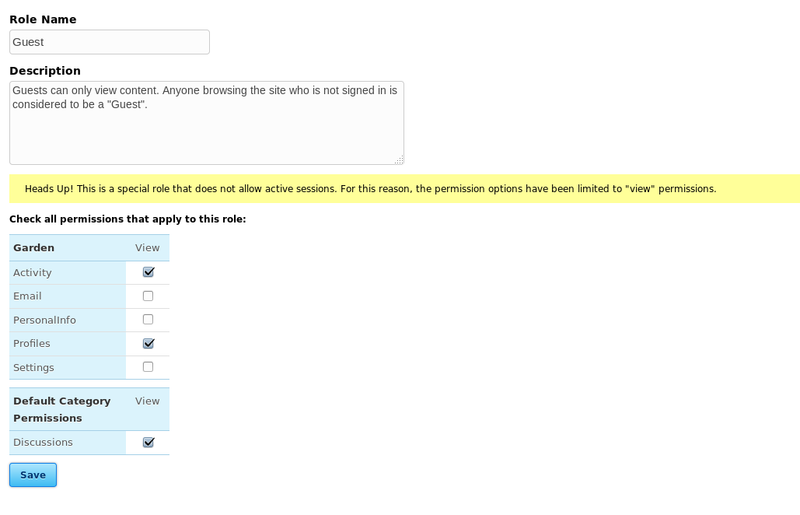 My New or Approved Users seem to get the wrong role. you will see this screen - check appropriate boxes as you wish and click save. 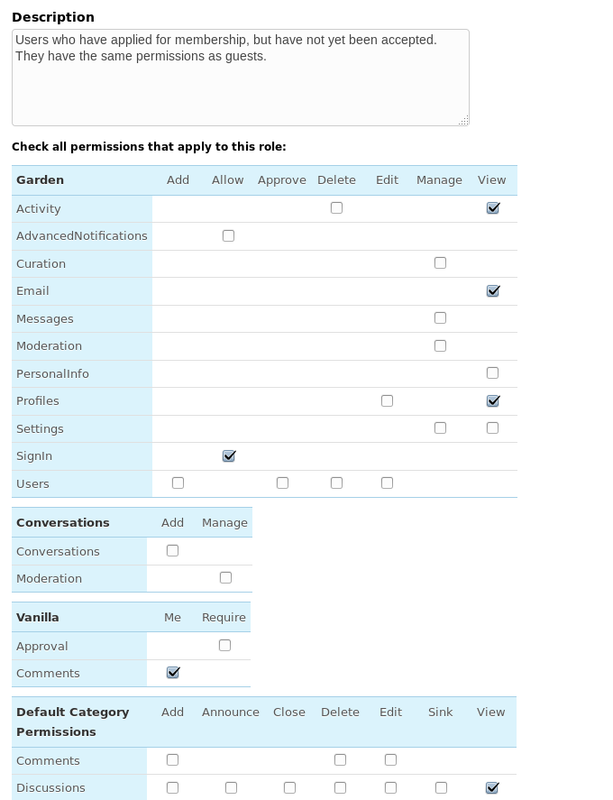 - 19 I changed my role and permissions settings in vanilla 2.1.5. 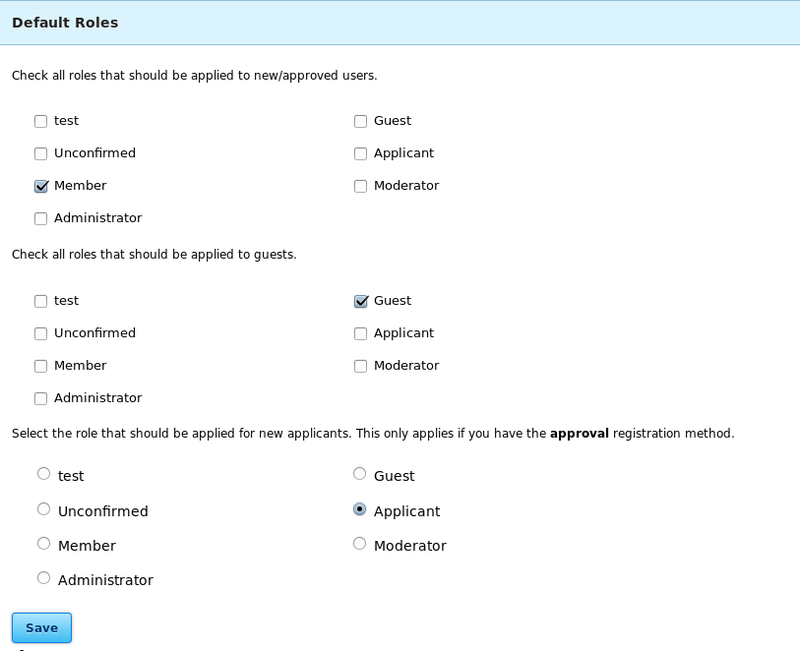 Can someone tell me the default settings for all the roles on a fresh install.